Rusney Castillo - A Building Block For The Red Sox? Rusney Castillo has proven that he should be a player that the Sox build around. Since the Red Sox called him up to make his major league debut, he has batted .333 with two home runs and six RBIs. He has hit home runs on back to back nights and has also started adjusting to the pitching. Every game he plays, he seems like he is getting a little more comfortable at the plate. He has shown speed, as he has stolen a few bases for the Boston Red Sox already. He has also made a few fantastic plays in center field, thanks to his speed. He has shown that he can be a five tool player who can be a threat to other teams. He has a good arm and has already stopped a few runs from scoring because he got the ball back to the infield so quickly. He has shown overall that he has good judgment and can be an everyday player. He has been exceeding many peoples expectations. This is a great sign because we now have someone that can replace Jacoby Ellsbury. The Sox could not find a center fielder the whole season, but now they have. Rusney Castillo is 27 years old and Ellsbury is thirty. Castillo has shown all of the talents that Ellsbury had and he is younger which is a plus for the Sox. Many people say that the Sox paid Castillo too much by giving him a 7 year contract worth 72.5 million dollars. This actually seems to be a great move because he has been producing and it saved them a lot of money. If the Red Sox had to go find a proven MLB center fielder that was good, it probably would have cost them prospects or additional money that they could have used to focus on other areas. They did not have to give away any prospects to get Castillo. Castillo has been pulling his weight. He has knocked Jackie Bradley, Jr. out of his starting job. This is a good thing for the Red Sox because they might be able to trade JBJ away and get pitching in return. Castillo is the everyday center fielder and a big part of the team. He should be used as one of the building blocks to restructure the team for next season. Stats from nesn.com and espn.com. 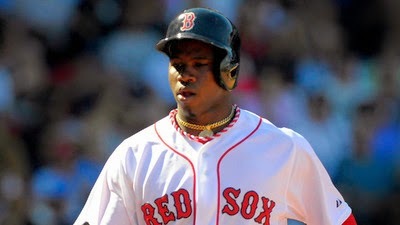 Photo from nesn.com.